A tree probably stood here centuries ago when this map was made. In today's time, a Cafe sits at the co-ordinates marked on the map. My quest for the Blue compass brings me crew to a small but busy island. I have been here before but never at this spot. I wondered what the next clue would be. But before all of that, I was hungry and there was a pizza festival inside the cafe. Quests can wait as a sailor needs his grub first. 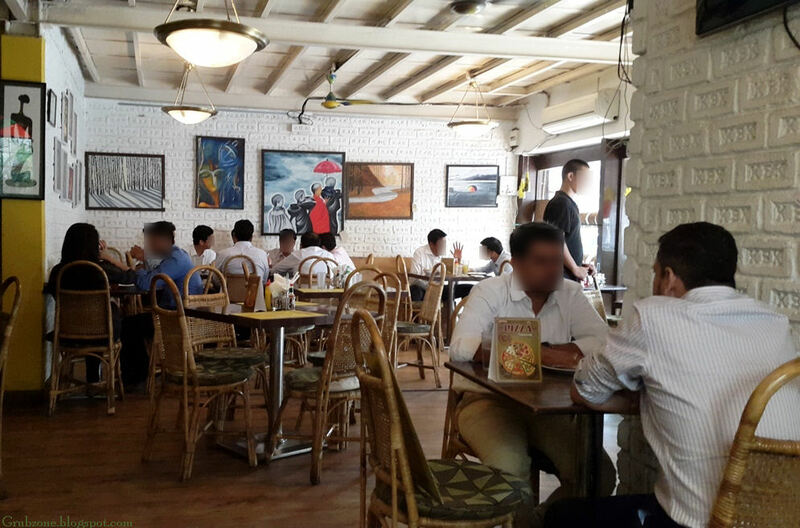 Cafe Free India sounds very much like a battle cry for Freedom from colonial forces. Or perhaps it represents the Free India after that. I would agree with the latter looking at the continental menu. Cafe Free India, which started as a nondescript eatery many years ago has become a popular spot for office goers and students alike. Its burgers in particular are well known throughout the city. But I was not here for that. 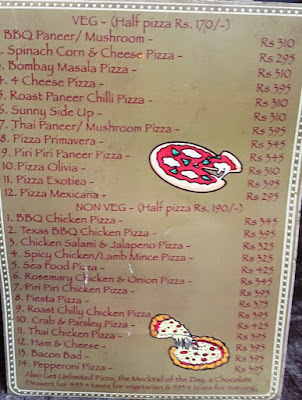 There was a pizza festival going on(And will continue till 7th March, 2016) and it would be quite a shame not to sample their pizzas in this period. Food festivals are fun mate. The ambiance feels very spartan. But despite that, there is a strange sensation of a comforting sanctuary in here. Perhaps it stems from the feelings of the white collared patrons who are temporarily relieved of their everyday stress as they gobble down some fine food. The art pieces that adorn the wall are made by local artists and are changed periodically. To be brief, the ambiance is that of a typical comfort cafe. Sometimes, I wish that I could store food in a timeless fourth dimensional space. With that ability, I could have stored one of each pizza in my trans-dimensional refrigerator ha. Silly science fiction fantasies aside, I sampled two pieces on the menu. 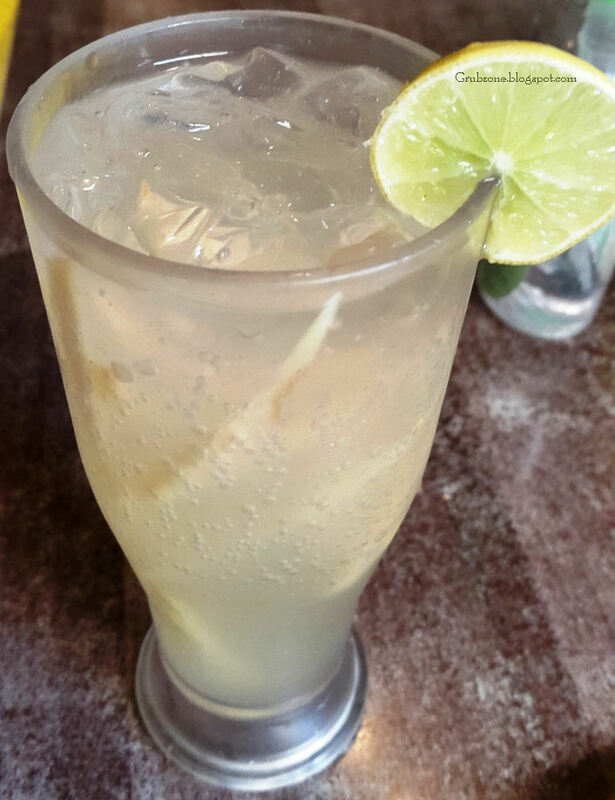 But before I move on to the pizzas, a mention needs to be made to this Gingerade. This was a Ginger drink with a dash of lemon. 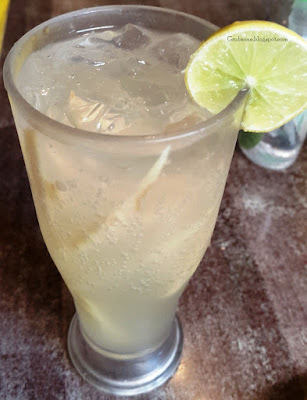 It was refreshing, appetizing and somehow made me feel really good inside. I felt as if I could jump up and punch the moon if I wanted(or atleast the cafe's ceiling). Think of it as a tastier version of the Green Tea. For many a years in my childhood, I had read about Ginger ales and Gingerades in Enid Blyton books. But I had never gotten around to trying these until today. And it was a great first time experience. Texas BBQ Chicken Pizza. There are two facts about this pie. One, it was a delectable pizza for sure. Second, it was not a BBQ chicken pizza by my expectations. The chicken may have been barbecued but the pizza was lacking the trademark BBQ sauce. 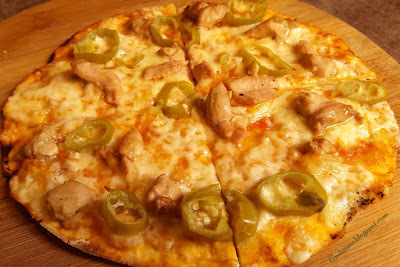 The Jalapenos added a bit of tang and the pizza's flavor was salty and savory as opposed to sweet and savory. Fiesta pizza was quite a treat. A real meat feast. The appearance looked really appetizing. Meaty, colorful, cheesy and a lovely aroma - what more does a pizza fanatic desire? It was loaded with bacon, salami and chicken. The thin base, the cheese and the different meats created a diverse flavor experience. The flavor changed depending on the meat most prominent in my bite. 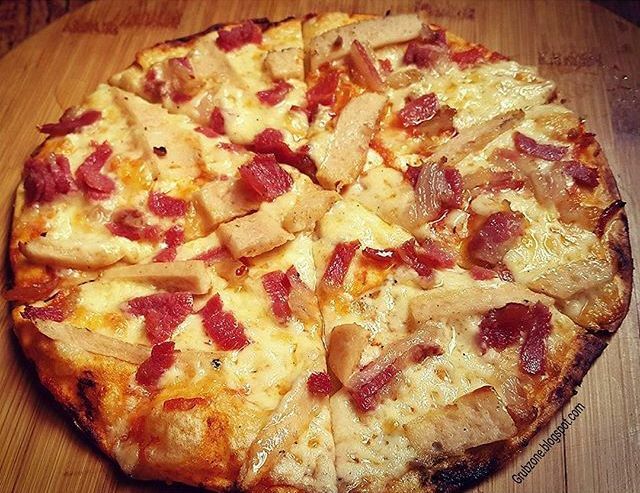 Three different meats, three different flavors, one pizza. I am told that this pizza is hugely popular and may probably make it to their main menu. Captain : Me tongue loves a meaty pizza, aye. First Mate : Avast mate, this thin piece of paper sticking under the table looks like a part of some map. This could be our clue. Captain : Our map is complete lad. No missing bits from it. This piece of paper cannot be from our map. The Red velvet cup cake may have not completely satisfied my voracious dessert appetite but it was still a delectable experience. 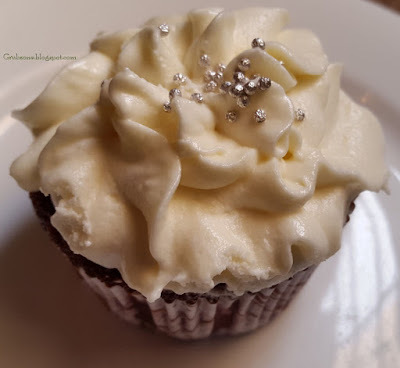 The cupcake fashioned out of red velvet cake was generously topped with sweet cream cheese. It may not make the colorful art piece for insta shutterbugs but it was quite colorful to the tongue. The cream cheese was really amazing and it tasted like a creamy English Toffee. The cake may however pale in comparison to the topping's sweetness. I sampled the cake separately after clearing my palate and it was satisfactory. A Red velvet lover would really enjoy this little treat. Captain : No clue so far. Will dessert save us again? First Mate : I have been staring at this old map mate. Though the map appears complete, there is one patch that appears abnormally white. It is, as if a layer has been stripped off from here. Captain : Could that mean? Let me stick that thin piece of paper on this patch....There. First Mate : It makes sense now. There seems to be something at this spot. Captain : Yes but what? This area appears to be in the middle of the sea. First Mate : A Hidden Island perhaps. The service was satisfactory but could feel a bit tardy. I had however gone at a time when the cafe was full so it could just be the rush hour blues for the serving staff. 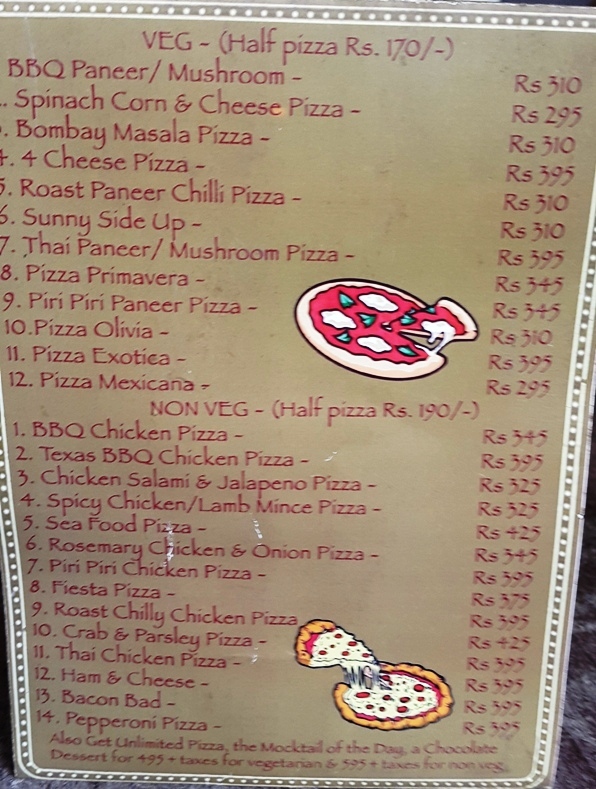 The pricing feels cheap for the pizza portions served. These are a lot cheaper than my local pizza guy. Based on this trip, I would say that CFI is quite a decent pizzeria. I am pretty sure that I will visit this place again to try their burgers too. That will be a story for another day I guess. "A journey into the unknown awaits us lads. But once we find that compass, we will be the strongest crew to ever sail the seas." Terttulia - Shivaji Park, Mumbai.